It’s difficult to imagine our daily lives without cats. Even the old Egyptians realised how special they were thousands of years ago! Now here’s your chance to put your favourite furry friend onto your smartphone! A first look at our large collection of smartphone cases will tell you everything you need to know about us, here at CaseCompany… We love cats. And not just domestic cats either. Lions, tigers… Everything feline, basically! Pick out your favourite cat case and make your smartphone purr out of pleasure! We offer you a couple of different options. You can go for one of Eva Mouton’s unique cat illustrations with a speech bubble, allowing you to combine it with a hilarious quote. Of course, the speech bubble is entirely optional. 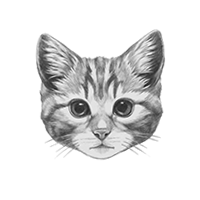 Or maybe you’d prefer some hilarious floating cat heads? Everything is possible. Our graphic designers thought of everything! Perhaps even a fancy and stylish cat wearing sunglasses and a tie? Easily the coolest cat to ever grace a smartphone case! As you can see, CaseCompany’s office is full of cat people. So hurry up and check out our collection online, it’s definitely worth a look!